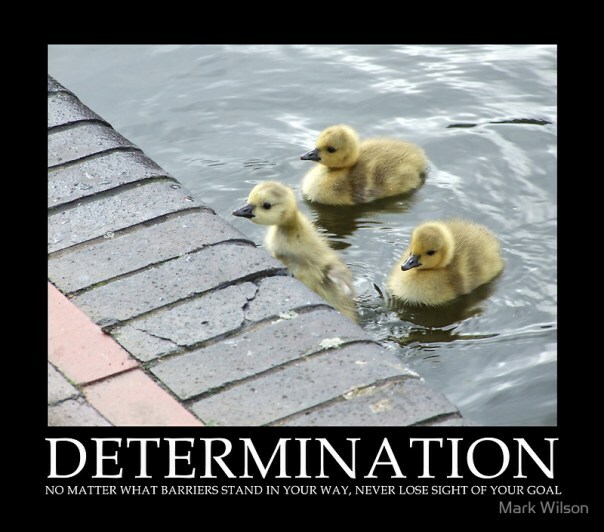 One definition of Determination by Merriam-Webster’s Dictionary is “a firm or fixed intention to achieve a desired end.” Well, until I can get my end up and over in the pool, my determination is firm and fixed to flip. I cut my swim workout short this morning (my first Thursday swim as I build to ultimately 6 swim workouts a week) to practice flip turns. Which first begins with the ability to flip in the pool. Five attempts, zero completions. One senior woman water walking and watching me said it looked like I made it half way around on one attempt. I wanted to get my swim in so I could get to work at a decent hour. After five attempts, I headed for the lap lanes. My swim went well for the most part, I only swam 1,600 meters. After a 600 warmup of 200 swim/pull/kick I went into two sets of a pyramid. It is more challenging than it looks on paper. First is to build with 25 meters, then 50, 75 and 100. Then you go back down 100, 75, 50 and 25. Each done on a time set equal to 1:10 per 50 – so 35 seconds, 1:10, 1:45. 2:20 and back down. After the first 500 I pulled for 100 meters to get a little break in. I started the second pyramid and at the peak with the first 100 two women who swim much slower than I joined my lane and wanted to circle swim. I had mixed emotions. Most of me didn’t want to share the lane especially when I would stop and wait for the next send off and they kept asking if I was done yet. But there was a little part of me that felt super fast as I lapped past them during my set. Now I know how all of those fast swimmers feel when they pass me. To get the workout finished I only did one 100 on the second set finishing with only 400 that set and a total of 1,600. Thanks Stew! I can use all the suggestions I can get! Flip turns are hard! One of the best suggestions I can give is to not view it as a forward somersault, but to think of yourself as rolling in the fetal position, a little bit sideways. Does that make sense? Great idea. My struggle in pulling in. I will give it a try. Thank you Brit! Well done! One of the greatest realizations of life is to see that we are all warriors, and the biggest battle is fought on the inside. I think you’re right to get some expert help…Sometimes when you try to do something over and over again without success you start forming a bad habit. Maybe there’s just some little thing that’s getting in the way of your flips, and when it gets pointed out to you, you’ll be able to fix it. It took me a long time to get really comfortable with flip turns, but I had a swim teacher that insisted I learn, and now they are second nature. Thank you! My friend who is coaching me insists on flips and I do as I am told. Good to know I am not the only one who struggled in the beginning.